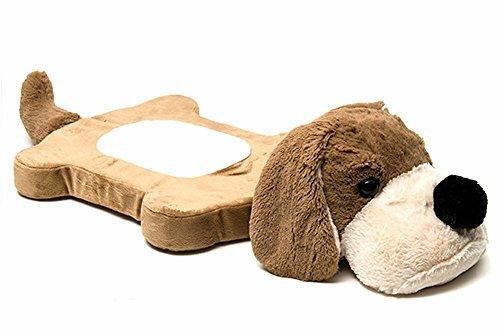 Designed and patented by chiropractor Kirt Josephek - and inspired by his dog Chester - Kidzooz ergonomic pillows are designed to cradle and support a child's head and neck. The Kidzooz patented marquis-shaped center cradles the head comfortably while firmer foam borders support the neck when your child is sleeping. Ergonomic kid pillows that protect the neck's natural curve, builds great sleep habits, and end stiffness and neck soreness in young children. The patented marquis shape, high quality microfiber center, and firm foam border support the head and neck while sleeping. Kidzooz kid's sleep pillows are hypoallergenic and washable. Available in three adorable animal pillow designs. Comes with a free Habitote tote bag, perfect for sleepovers! If you have any questions about this product by Kidzooz, contact us by completing and submitting the form below. If you are looking for a specif part number, please include it with your message.